Want to warn your Former tenants you will report? Sometimes the impending derogatory information on a former tenant's credit report can be enough to make them cooperate in paying you what they owe. We have found that when a former tenant values their good or clean credit and they are warned that the landlord will report negative information affecting their credit report, their debt is taken more seriously and they will try to pay. 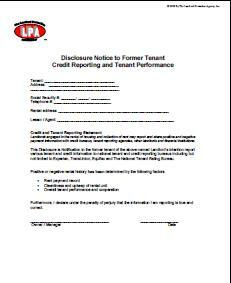 I hope this form helps you get paid from former tenants who still owe you money!